Halloween is upon us and it's time and there has been a tradition of Halloween-themed television specials and episodes of your favourite shows. Test your knowledge with this not-so-spooky ten-question quiz. 1. 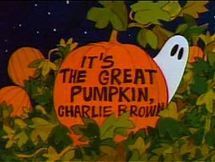 In the celebrated 1966 Halloween special It's the Great Pumpkin, Charlie Brown, Linus goes to the mail box to send his annual letter to the Great Pumpkin. He can not reach the mail box and his sister, Lucy, refuses to assist him. How does Linus manage to open the mail box? A. He uses a step ladder. C. He uses his blanket to open the box. D. He opens it with a broom stick. E. Charlie Brown hoists him up. 2. In an episode of The Cosby Show, Vanessa Huxtable (Tempestt Bledsoe) hosts a Halloween party. Her mother, Clair Huxtable (Phylicia Rashad), dresses up as a well-known celebrity. Name the celebrity. 3. In a 2005 Halloween episode of The Office, Michael Scott (Steve Carrell) is ordered to downsize. While everyone at the office celebrates Halloween, Michael agonizes about whom to fire. However, he still manages to wear a costume in the episode and dresses up as . . .
4. The long-running sitcom Home Improvement, starring Tim Allen and Patricia Richardson as Tim and Jill Taylor, is known for its Halloween episodes. One of those episodes, "A Night to Dismember," revolves around youngest son Mark Taylor's (Taran Smith) attempt to do what? 5. Not surprisingly, Bewitched always provided some good Halloween-themed entertainment. The show's 1966 Halloween episode centres on a weird Halloween party that Endora (Agnes Moorhead) holds at the home of her daughter Samantha (Elizabeth Montgomery) and son-in-law Darrin Stephens. What legendary athlete just happens to show up at the party? 6. In another Halloween episode of Bewitched, something happens after Samantha reads a Halloween book to her daughter Tabitha. What happens? A. Samantha disappears and becomes a character in the book. B. Tabitha's voice begins to sound like the voice of a scary old ghoul in the book. C. Tabitha brings to life three spooks from the book. D. Darrin becomes a ghost and only witches can see him. E. Tabitha is unhappy when Darrin takes the book away and she casts a spell on her father, turning him into a pumpkin. 7. In the animated special It's the Great Pumpkin, Charlie Brown, poor Charlie Brown keeps receiving something other then candy when he goes trick-or- treating with his friends. What does he keep getting? 8. Who played a hilarious version of Dracula in the 1979 Halloween special The Halloween That Almost Wasn't (This is your bonus question so give yourself an extra points if you answer it correctly)? 9. What was the title of the Dr. Seuss animated Halloween special? 10. What Hollywood actor appeared on a 2001 Halloween episode of Friends? Linus uses his trusty security blanket to open the mail box and throws in his letter to the Great Pumpkin. Clair Huxtable dresses as Tina Turner at her daughter Vanessa's Halloween party in an episode of The Cosby Show entitled "Halloween" (Season 2, Episode 6). She wears a miniskirt and sparkly top. The episode aired on October 31, 1985. In the Halloween episode of The Office which aired on October 18, 2005, Michael, played by Steve Carrell, dresses up as a two-headed Michael. In the episode of Home Improvement which aired October 28, 1997 (Season 7, Episode 5), Mark informs his parents that he is in a film class and that he intends to make a horror movie. The Bewitched Halloween episode, "Twitch or Treat," aired on October 27, 1966. Willie Mays made a brief cameo appearance as himself in that episode. To watch "Twitch or Treat," click on the link below. In the Bewitched Halloween episode, "The Safe and Sane Halloween," Tabitha materializes three spooks from the pages of her book. The spooks follow Samantha and Tabitha for an evening of trick-or-treating. This episode aired on October 26, 1967. While his friends receive various Halloween treats during trick-or-treating, Charlie Brown gets a rock from every house he visits. Peanuts creator Charles Schulz said that when the show first aired, fans worldwide sent in candy "just for Charlie Brown." Judd Hirsch played Dracula in The Halloween That Almost Wasn't, a story in which Dracula hears rumours that Halloween may cease. He orders all the other monsters to become more scary or leave his castle. 9. The 1977 Dr. Seuss Halloween special was titled Halloween is Grinch Night. In this special, the evil Grinch comes down the mountain to terrify the Whos of Whoville when the "sour-sweet wind" blows. Grinch Night, click on the link below. Sean Penn was a guest star on a Halloween episode of Friends that aired on November 1, 2001. In the episode, Monica (Courtney Cox) and Chandler (Matthew Perry) hold a costume party and Penn plays a character named Eric.